doi:10.4236 /ojog.2011.13018 Publ ished O nline S ept ember 2011 (http ://www.SciRP.org/journal/ojog/). Department of the Sci ences for Woman’s and Child’s Health, University of Floren ce, Italy. Received 30 May 2011; re v i s e d 5 July 2011; accepted 13 July 2011.
from about 20 to 46% in various countries [7-9]. ing the specific sero p r evalence . 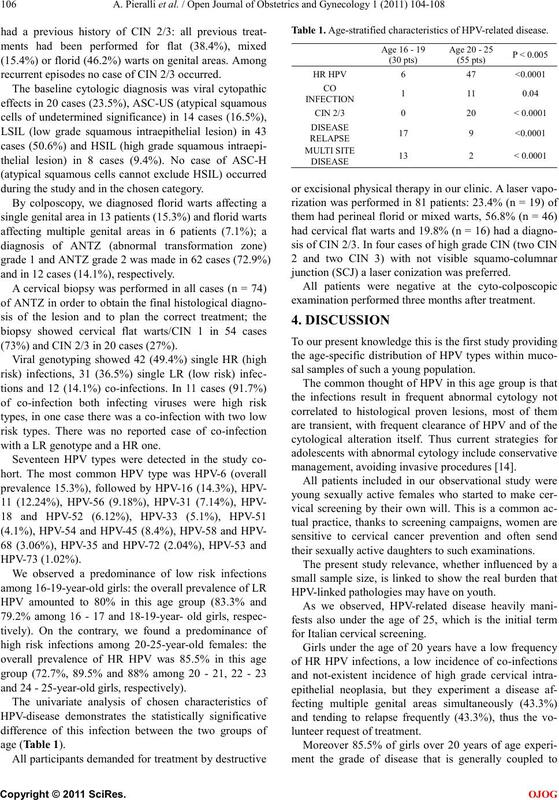 as marker of HPV infection and linked pathology . rapy Office of Careggi U niversity Hospital in Florence. patient or, when under 18 of age, from her legal tutor. tion consisted of indigenous Italian ethnic origi n.
- 5 hours (EZ1 DNA Tissue kit, QIAGEN, Germany). housekeeping gene beta-globin, as internal control. order to obtain the histological diagnosis of the lesion. extended into the end o cer vix (excisional method). to 4000 W/cm 2, guided by a micromanipulator. mont hs from diagno sis. and 55 to the age group 20 - 25 years. recurrent episodes no case of CIN 2/3 occurred. duri ng the study and in the cho s en category. and in 12 cases (14.1%), respectively. (73%) and CIN 2/3 in 20 cases (27%). with a LR genotype and a HR one. and 24 - 25-year-old girls, respectiv e l y) . Table 1. Age-stratified characteri stics of HPV-related disease. junction (SCJ) a laser conization was preferred. examination performed three months after treatment. sal sa mples of suc h a young population. mana gement, avoiding invasive procedures [ 14]. their s exually active daughters to such examinations. HPV-li nked pa tho logies may have on yout h.
older women, because principally infected by HR HPV. witho ut external clinical manifestations of the infection. prevalently infected by HR HPV, suffering by CIN 2/3. - 24, as other worldwide countries already did . 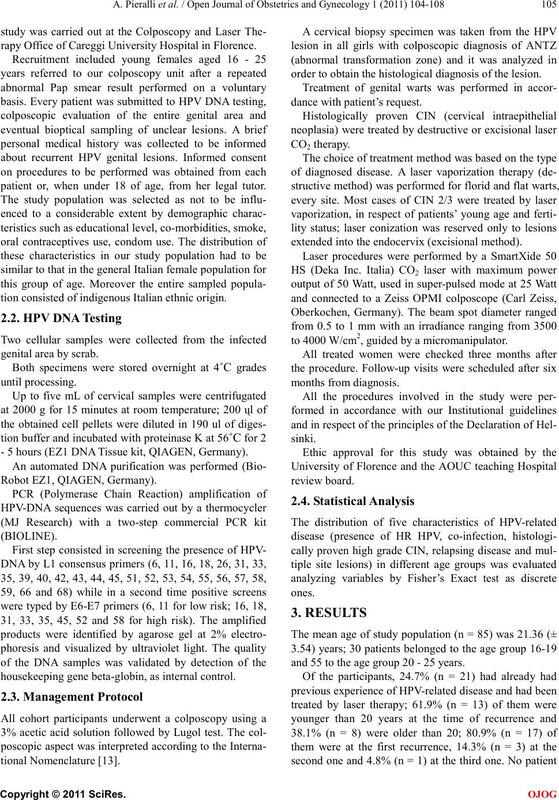 HR HPV linked disease [1 6 ] . cation of HPV genotypes within different groups of age. ually transmitte d infections [18 ]. group compared to the mature one. such as multisite H PV le sions. distribution of differ ent HPV genotypes. Lenselink, C.H., Melchers, W.J.G., Quint, W.G.V., et al. year old women in the prevaccine er a in the Netherlands. Burchell, A.N., HRichardsonH,H HH., HMahmudH,H S.MH., et al. clinical trials of a quadrivalent HPV (6/11/16/18) vaccine. Archives Gynecology and Ob st etrics, 279, 803-807.
land Journal of Medicine, 338, 423-428.
hort of Tuscan women aged 18-24: Results at recruitment. BMC Inf ectious Di seases, 10, 157-167.
in young women. Lancet, 364, 1678-1683. Sexually Transmitted DisHeases, 86, 49 4-499.
women. BMC Infectious Diseases, 10, 238. Journal of Obstetrics and Gynecology, 197, 346-355. Europe. HEuropean Journ al of CancerH, 45, 26 49-2658.
erican Medicine Associati on, 293, 1471-1476. HHwang, L.YH., HScott, M.EH., HMa, YH. and Moscicki, A.B. Reproductive Immu no l ogy, 88, 66-71.